Another worthy entry in the small Face family - an aggressive vintage fuzz for Hendrix tones and beyond. Cuts through brilliantly in a band mix. Jimi obsessives will love it. Meaty fuzz tones. To the casual fan, there's not much between this and the FFM3. Back in 2013, Dunlop's Fuzz Face Minis captured our hearts with pedalboard-friendly enclosures and classic dirt tones, and none more so than the FFM3 Jimi Hendrix. "You'll find the best tones by lowering the gain and boosting the level for meaty fuzz-meets-amp drive blends"
But while that model replicated the BC108 silicon transistor-driven sound that featured on much of Jimi's studio work, the new Band Of Gypsys edition aims to nail the sound of a mysterious white-knobbed red Fuzz Face that accompanied Hendrix on stage for legendary shows at Woodstock, Berkeley and the Fillmore East. There's certainly a wilder, edgier tone to the FFM6, with a piercing shriek on bridge pickup sounds, and flutey sustain from the neck position. 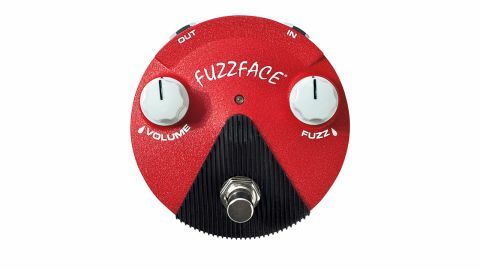 Octave overtones shine through on ringing chords, which lend this Face a unique tonal flavour, especially when you up the gain for more modern fuzz textures. However, you'll find the best tones by lowering the gain and boosting the level for meaty fuzz-meets-amp drive blends. With the same mid focus as its predecessor, the FFM6 is extremely usable in a band mix, and cleans up with a quick twist of the volume knob. To the casual fuzz fan, there's not a huge distinction between the FFM6 and FFM3, but for Jimi obsessives, this is the Holy Grail, and makes laying down raucous Strat licks a satisfyingly authentic experience.